A garden makeover doesn't have to be complicated! Take this corner arrangement, which was transformed from a rubble filled building site in only a couple of days, as a diy project. It's amazing what can be done with a few basic materials and a bit of planning. The first is a very small garden, only ten metres square. "What a mess. There's nothing you can do with this garden, other than put in a rectangular lawn!" 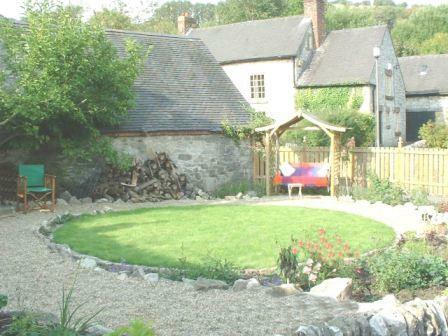 Only a short time later, this is what was achieved on a seriously small budget - a very lovely circular garden. 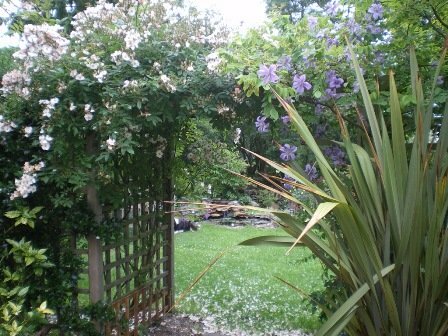 With the help of friends, and existing limestone - which was used for the edging - the feeling of peace and tranquility makes this a very special cottage garden, much admired by everyone now that the plants have developed and the climbers have covered the fence. The swinging arbour is the focal point. 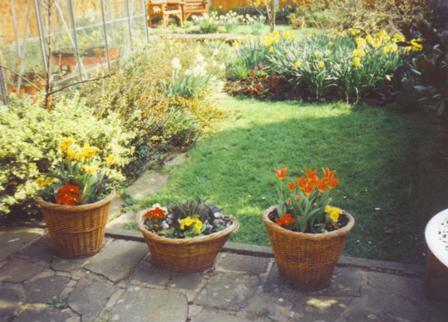 A herb bed sits on the right (very important for Jo-anne's wonderful cooking). And a magnificent magnolia fills the left corner with its majestic blooms. 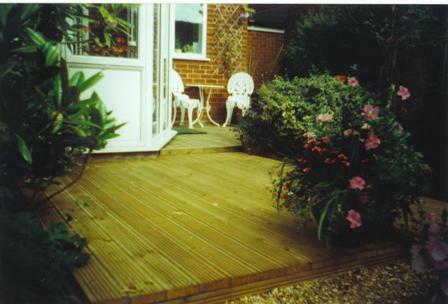 The next example shows a self-contained project, replacing a crazy-paving patio and lawn with split-level decking. The lawn was rather shaded by the boughs of a magnificent magnolia gradiflora. Taking a breather, sitting on the joists. Well it was a very hot day! This was in my mum's beautiful garden; always so full of colour, at any time of the year. You can see the membrane that was used to suppress any weeds. And here is the garden makeover finished. It took two of us about eight hours to complete. 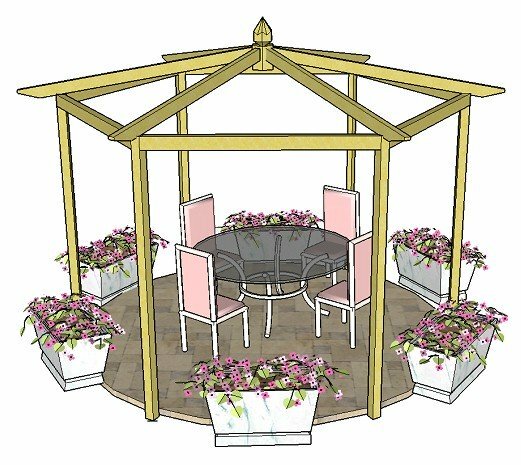 Let's take a look at a bigger, whole garden makeover design. This space was very overgrown. It had an old greenhouse in the middle and was completely full of rubble on the far side. It actually looks better on the photo than it was in reality. 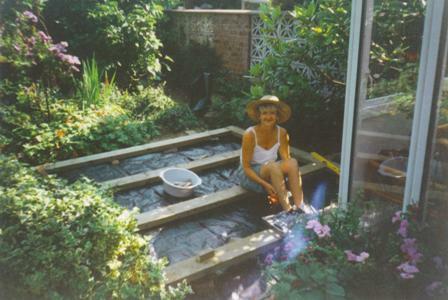 Emma loves plants, entertaining and being outdoors, and was determined to have a garden that allowed her to 'potter' to her heart's desire. This is how it looks now! A massive and wonderful transformation. It is split into three levels, with many access points from different parts of the garden and house. It also has a natural stream running down the far side - a unique and interesting feature, with woodland-style steps, made from sleepers, running beside it. The eye is drawn from the conservatory on the right, through the water feature in front, then to the dining area on the second level, and finally to the corner arbour at the top. This sweeping arc was a major design feature within this stunning garden. 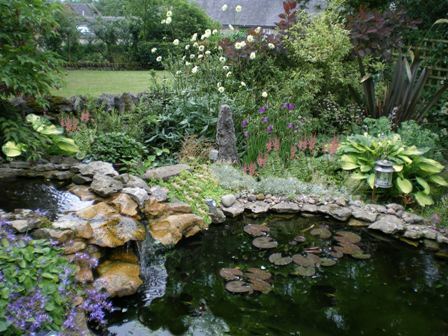 Next we have a natural pond, which was part of a complete garden design. A bit of a state, I think you'll agree! And here we have it after the makeover. This is a close-up of the pond and waterfall. A much more pleasurable way to spend time in the garden, next to the sounds of the waterfall and surrounded by colourful plants! You can see other parts of the garden, from a different angle, below. 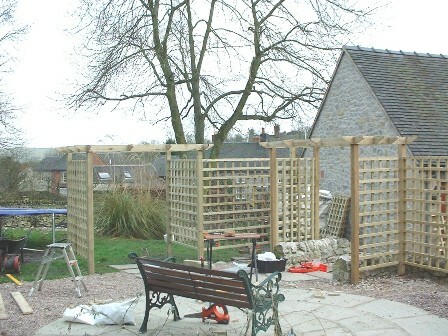 This was taken just after the construction of the secluded patio area was underway, and forms the basis of the free pergola plans. And here is the pergola clothed in the most beautiful climbing plants. 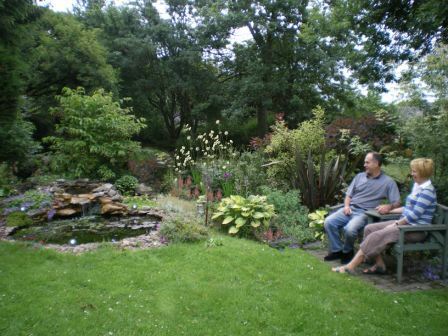 The pond can just be seen through the pergola, leading the eye and drawing you on a journey through the garden. 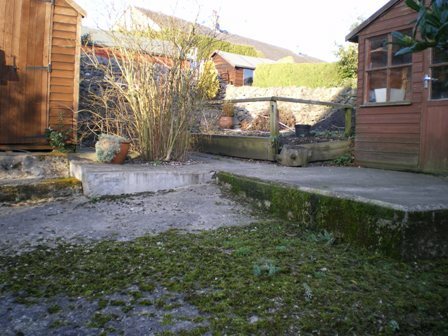 Although part of a much larger garden makeover, it could have been done as a separate garden design project. 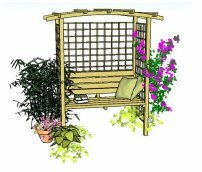 There are a choice of places to sit both in and out of the sun, a variety of materials to give texture and interest, as well as various shapes and levels. 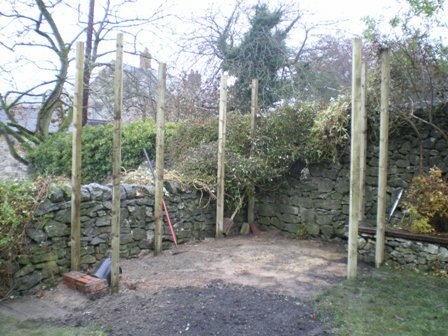 And here is another part of the garden, where a corner pergola is being built. 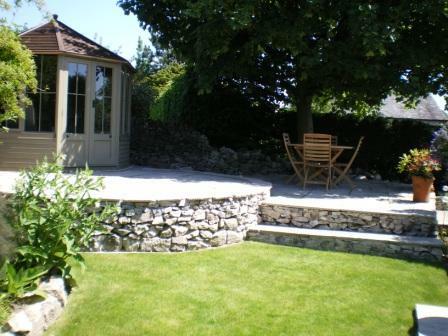 Creating a garden on a new plot can seem daunting - the ultimate garden makeover. 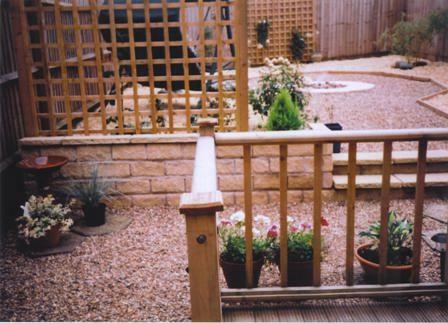 See this as a fantastic opportunity for a landscaping design that is your ideal creation! 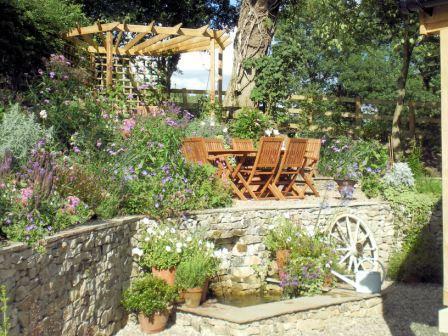 This last garden was built on a shoestring (it only cost a few hundred pounds! ), which is why I've included it. 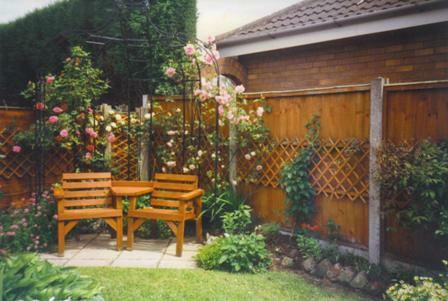 The garden design remit was for a low cost, extremely low maintenance, calm and peaceful space. Full of rubble and field grass, and on a slope, there was a bit of work to be done! The first job was to clear some of the grass before getting the rotovator going. The full house-width deck is ideal for yoga, meditation and entertaining. 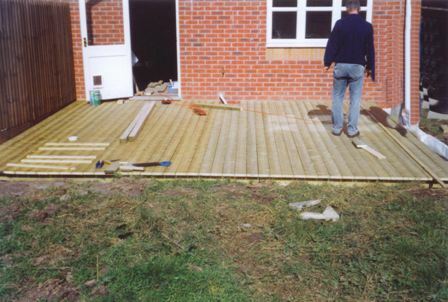 In the photo, we are just about to start constructing the balustrade with a few posts, some D-rails and laths. A swinging hammock-seat overlooks a small self-contained fountain water feature. Different textures and areas have been used to add interest. 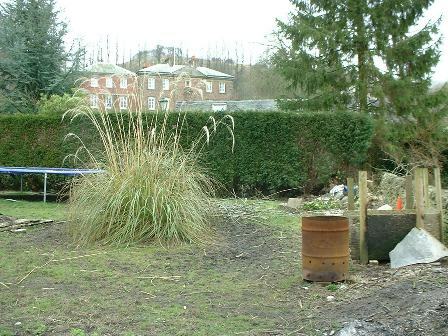 Some plants have been planted in the ground - the twisted willow giving a very 'zen' feel to the garden design - but many are in pots. 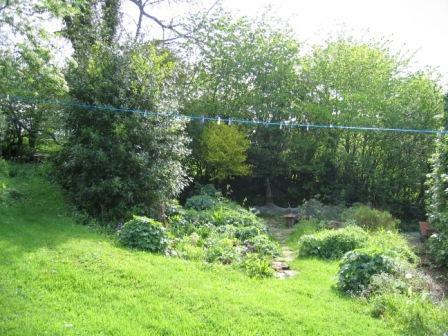 This garden does indeed need very little care, and shows what can be achieved quickly - and without breaking the bank. The photo was taken soon after construction. The willow is now a wonderful shape and the plants have begun to develop. ...a fabulous extension to the house, leading from french doors out onto a tiled and decked roof garden, which overlooks beautiful scenery, might just be the job! I hope these garden makeover pictures have given you some ideas and inspiration to have a go yourself. Take it a bit at a time, if necessary. You don't need to do everything at once. 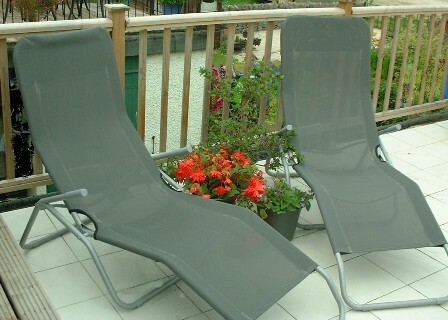 Make your garden a place where you can be comfortable, relaxed and surrounded by beautiful things. You deserve it - and so does your garden! 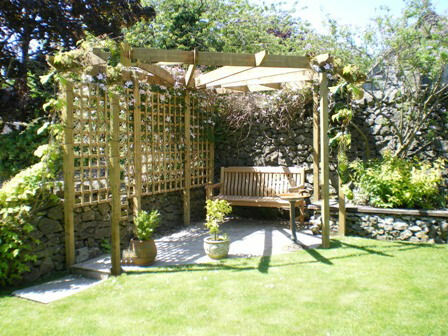 For ideas and inspiration on incorporating a pergola in your garden, take a look at some pergola pictures. 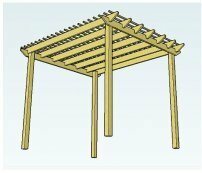 Ideas for choosing a pergola style and placing your pergola in a suitable position see these pergola ideas.